Though this year’s Captain America: Civil War featured plenty of hero vs hero battles, 2012’s The Avengers was where the struggles began for Marvel‘s heroes, featuring just as many fights between them as the film’s villain. When the rest of the MCU joins them for Avengers: Infinity War, there’s going to be even more tussling. 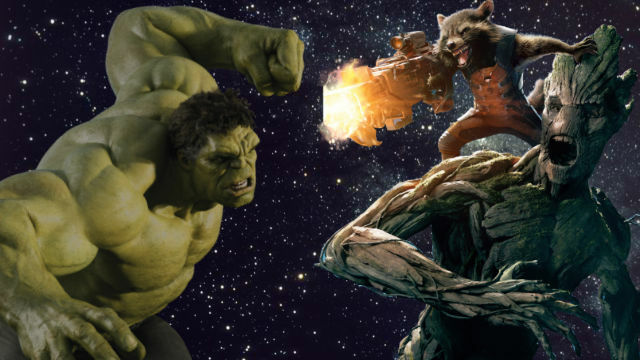 Speaking with Screen Junkies, Vin Diesel says that everyone’s favorite flower-giving tree, Groot, will be getting into a bout with an Avenger. The two characters previously fought in the comics, where Hulk fought a number of monsters in 1976’s Incredible Hulk Annual #5. The Hulk won. Diesel also offered hope for a Rocket and Groot spin-off, saying if it was up to just one person, it would be happening. Directors Anthony and Joe Russo, who return after Captain America: The Winter Soldier and Captain America: Civil War, will direct both Avengers: Infinity War and the untitled fourth film, which are written by screenwriters Christopher Markus and Stephen McFeely. Both films will also be shot entirely with IMAX cameras. It remains to be seen which characters will be the primary focus of the films, though we do know that Captain Marvel will appear in the movies ahead of her solo movie in 2019 and that the film will feature the combined forces of The Avengers and the Guardians of the Galaxy. Marvel’s Avengers: Infinity War is slated for a release in theaters on May 4, 2018, with its follow-up set to open on May 3, 2019.